The EID Journal today has published a new letter describing the clinical signs and symptoms from a cohort of 57 lab confirmed Zika cases seen at a Brazilian clinic in 2015. Although commonly called `Zika Fever', it turns out that fever is far from most common symptom, and was absent in about 1/3rd of the cases in this study, and was generally low grade in the others. 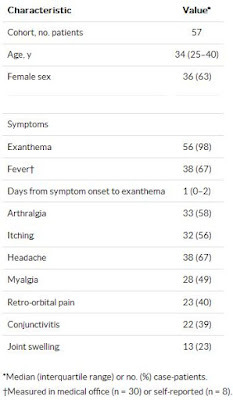 Exanthema (rash) was the most commonly reported symptom at 98%, followed by headache and fever (both at 67%), arthralgias (58%), myalgias (49%), and joint swelling (23%). Conjunctivitis (39%) and retro-orbital eye pain (40%) were also commonly reported. I've only included some excerpts, so follow the link to read the letter in its entirety. Cerbino-Neto J, Mesquita EC, Souza TML, Parreira V, Wittlin BB, Durovni B, et al. To the editor: Zika virus infection, which has been associated with microcephaly and other neurologic disorders, has reached the level of public health emergency of international concern (1). 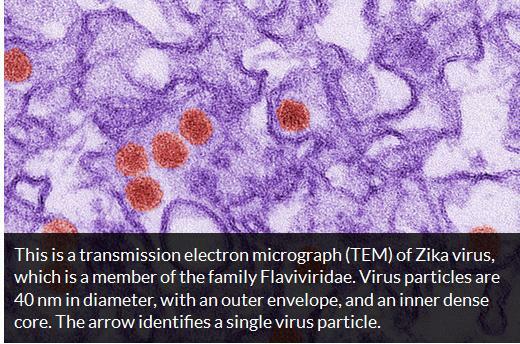 Zika virus (family Flaviviridae, genus Flavivirus) is transmitted by mosquitos of the genus Aedes (2). The virus was first isolated from a serum specimen from a rhesus monkey in the Zika Forest of Uganda in 1947 (3). 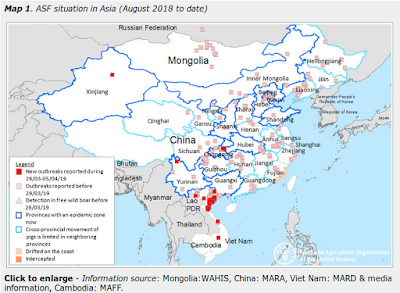 After 2007, a rapid geographic expansion of the virus was observed, including outbreaks in the Pacific region (4) and, more recently, in South America. Brazil reported the first autochthonous case of Zika virus disease in April 2015 (5), and subsequently, increasing numbers of cases have been reported, especially in northeastern Brazil (6). Studies on the natural history of Zika virus infection are scarce. Previous research defined Zika virus infection as a dengue-like illness, typically characterized by fever, maculopapular rash, arthralgia, and conjunctivitis (4). Although some patients have all of these symptoms during early onset, fever is not an early symptom for all. Here we describe the frequency of signs and symptoms from a sample of clinic patients in Rio de Janeiro, Brazil, who were later confirmed to have Zika virus disease by using real-time reverse transcription PCR (rRT-PCR).